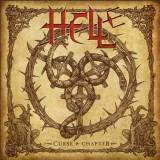 Producing a wonderful début in 2011 after a long and tragic history that stretched all the way back to 1982, UK theatrical heavy metallers Hell have produced a follow-up in much better time. And although it's nowhere near as good, Curse and Chapter ticks many of the same boxes that made Human Remains such a pleasure. Keeping the same line-up as before, with most notably Andy Sneap on guitars and stage and television actor David Bower providing his gloriously over-the-top vocals, the band are still a classic heavy metal machine, although the sheer amount of theatrical cheese has been toned down considerably from last time. After orchestral opening Gehennae Incendiis, first track proper The Age of Nefarious leads with classic power metal widdling and Bower's vocals more melodic than I remembered. There's a wonderfully odd break for a Dream Theater-esque keyboard squelch solo, and the chorus is a grower rather than instantaneously catchy, but it's a great opening and establishes the album well. Not that the album needs it. Bower is clearly a main attraction, but the surrounding mix of old-school power metal with a touch of King Diamond-esque drama is excellent, and the guitars provide the variety sometimes lacking from the vocals, which are great but don't have enough of that intense charisma to carry the album alone. An example is the seven-minute Darkhangel, which opens with groovy chugging and takes a turn towards classic Edguy territory further in. It doesn't always work – what on earth is that sub-Metallica riff in Harbinger of Death? - but it's notably smoother and more uniform than Human Remains, to the point where some tracks could seem slightly too samey. That's where Curse and Chapter ultimately drags a little, it's more mature; the songwriting overall being less varied than before, standing or falling on the strengths of the hooks rather than the theatrical atmosphere. Fortunately, the hooks are usually solid, and there is some variety to keep the listen exciting even if it's lesser than before, from giving instrumental Deathsquad a touch of Rush- and then Maiden-esque drama, to letting the reins of control go slack on the less sane Deliver Us from Evil. It's never as excitingly unhinged as Human Remains, but follow-up albums are rarely as much fun as the original masterpieces, and as seen from the likes of A Vespertine Legacy, Hell are maturing into a band that writes good, catchy songs with depth. Remarkably, after twenty years spent dormant, Hell are still a name that very much deserve the attention of old-school heavy metalheads – certainly one of the best power metal releases of this year.